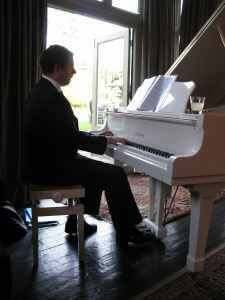 Are you looking for a pianist who can play for weddings at the beautiful Olde Bell in Hurley? The charming venue has a beautiful white Yamaha concert grand piano in the Malt House. This hosts weddings of a smaller size; or a stage piano can be used to play for larger weddings in the Barn across the road. Locally based, and frequent performer at the Olde Bell, pianist Simon Jordan is your ideal choice to entertain you on the grand piano during your ceremony, drinks reception or wedding breakfast. Simon is recommended by the Olde Bell and regularly appears at the venue’s wedding open days; he can play using the grand piano in the Malt House or bring his own stage piano to entertain you. He plays from two iPads with over 1,000 songs, and many more in his head.